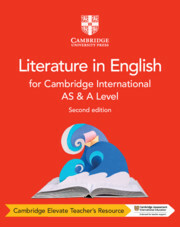 Updated and fully aligned to the new Cambridge International AS & A Level Literature in English 9695 syllabus for examination 2021. 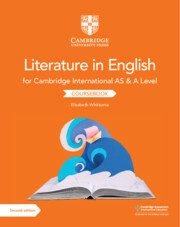 This coursebook helps inspire a love of literature in English and builds greater confidence in analysing and writing about texts. Part 1 introduces students to the basics of poetry, prose and drama through a wide variety of international texts. In Part 2, students hone their skills by analysing sample student responses to essay questions, passage analysis tasks and unseen texts. The final part encourages independent learning with advice about essay technique and avoiding common errors. This second edition includes more opportunities for self-assessment and reflection. Answers to the coursebook questions are in the teacher’s resource. Provides flexible, in depth guidance on how to analyse poetry, prose and drama, which students can apply to any text. Incudes annotated sample answers and a dedicated section on ‘Essay writing skills and techniques’ to encourage independent learning. Helps students to develop a ‘toolkit’ for studying literature, which will enable them to approach any unseen text with confidence. Helps to students to prepare for examination, with essay writing guidance, detailed analysis of sample answers and strategies for improving key skills.